The vein collection has a subtle stripe running through the fabric (light blue on light blue) inspired by the veiny pattern of a leaf. Please click on the image of the blanket or sheet to enlarge in order to be able to better see the pattern. 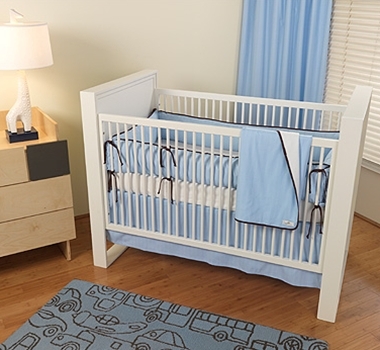 Vein Crib Bedding is sold in a set with the choice of a Vein Printed or Pure White Fitted Crib Sheet, each piece is also sold separately.